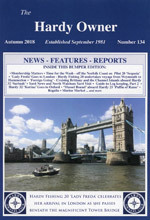 The Hardy Owners Club magazine is published three times annually and is sent to all current Members of the Club. 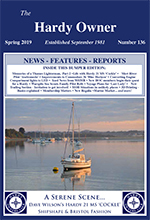 In addition, there are currently 92 back issues - with a searchable index of contents - of the Hardy Owners Club magazine available for HOC Members to download as Adobe Acrobat Document pdf files. Further back issues will be added from time to time. 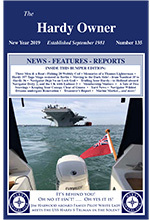 Memories of a Thames Lighterman, Part 2 - Life with Hardy 21 MS 'Cockle' - Meet River Pilot 'Andromeda' - Improvements to Commodore 36 'Blue Horizon' - Converting Engine Compartment lights to LED - Yard News from WHMB - New HOC members begin their quest for a Hardy - Warspite Sea Scouts Family Pilot Refit - Voyage Plans for 'Last Lady' - New Trailing Section - Invitation to get involved! - MOB Situations in unlikely places - 3D Printing - Basics explained - Membership Matters - New Regalia - Marine Market... and more! Editor: Marie O'Connell - Three Men & a Boat: Fishing 20 Wobbly Cod - Memories of a Thames Lighterman - Hardy 357 Tago Mago restored in Berlin - Moving to the Dark Side! : from Nauticat 35 to Hardy 36 - Navigator Déjà Vu on Loch Goil - Trailing Your Hardy: to Holland aboard Navigator Dotty 2, and the UK with Eadmer 3 - A Tale of Two Seawings - Keeping Your Canopy Clear of Guano - Yard News - Navigator Wildest Dreams undergoes Renovation - Treasurer's Report - Marine Market... and more!